A pearl of the Mediterranean; a hub for the Rich and Famous! Situated on the French Riviera in Western Europe, the Principality of Monaco is considered to be the second smallest yet most densely populated country in the world. It shares borders with France on three sides and the Mediterranean on the other. It is considered to be a safe haven for the wealthiest due to its taxation system. Most importantly, there are many things to do in Monaco for tourists because of its mild temperature and exquisite attractions. 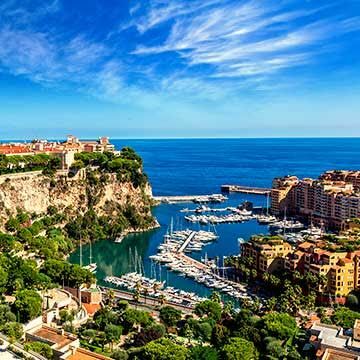 If you are thinking of experiencing something different for your summer vacation, you should know that there are a range of things to do in Monaco, a sovereign state that borders with France in the western region of Europe. With a population size of nearly 38 thousand inhabitants and an area size of over 2 square kilometers, Monaco is viewed as the most densely populated state in the world. However, its small area should not be mistaken for a place unfit for tourism, since it has a rich history and contributes significantly to the economic status of Europe. Out of the many things to do in Monaco you can explore, you should definitely make a trip to the Oceanographic Museum, which is dedicated to educate visitors about marine sciences and information about the oceans. Opened to the public in 1910, the Oceanographic Museum is built in the splendid Baroque revival architecture in a period of 11 years. It contains an extensive collection of a diverse range of sea animals, some of which are turtles, jellyfish, rays, sharks, lobsters, seahorses, starfish, sea urchins, cuttlefish, and eels. It also contains fragments of ship wrecks and ships, as well as skeletons of many animals, which easily attract a lot of attention from visitors. This is a particularly excellent place to take your spouse or children or to enjoy quality time with your friends. Another place you can add to your list of things to do in Monaco is visiting the Prince’s Palace of Monaco. This is the Prince of Monaco’s official residence and is visited by scores of visitors. The palace was built in the late 12th century, and has centuries’ worth of history contained in it from the many sieges of foreign powers and for being the refuge for the Grimaldi family, who were the region’s feudal lords and exercised considerable authority. You can find a number of guided tours of the palace with separate prices for adults and students. Be sure to take your digital camera to capture some of the best images of the Palace’s exquisite architectural features and characteristics. Furthermore, there are also a wide range of restaurants to help you experience a unique taste. Among the many that you should include as part of your things to do in Monaco list is the Le Saint-Benoit seafood restaurant. Here, you can indulge in Monaco’s most succulent fish and prawns along with other unique flavors of the sea that can overwhelm your mind. Summer is practically just a few weeks away and if you have not decided where to visit yet, chances are that you will have to settle for a place you are not particularly happy with. Before you regret not planning well ahead of time, you should consider going to Western Europe. You will be amazed at the variety of things to do in Monaco. Although it is known as the most densely populated states in the world, it has many places of historical and cultural importance, as well as a selection of exotic beaches that can leave your awestruck and entertained throughout your trip. Visiting Europe can be the ideal surprise for your spouse and children, owing to the various places to visit in Monaco that are fit for a fun-filled family adventure. Whether you are a type of person who enjoys relaxing in the beach or park or likes to learn about European history and architecture, Monaco has it all. Out of the many places to visit in Monaco that you can explore, you may find Monaco City to be the most enjoyable. Located in the Principality of Monaco, Monaco City is more commonly known as ‘The Rock’ since the name ‘Monaco City’ is not a city, but a district located on a vast mountain. The most interesting thing about Monaco City is that it dates from medieval times and contains a great number of landmarks and attractions that are of historical and cultural significance. Among these include the Palais Princier, Saint Nicholas Cathedral, Oceanographic Museum, St, Martin Gardens, Fort Antione Theater, Museum of the Chapel of Visitation, and Chapelle de la Misericorde. You should also visit the French Riviera, which is the coastline of the Mediterranean that includes Monaco and extends between the Italian border and Saint Tropez. The coastline contains a wide range of luxury hotels, restaurants, beaches, and shopping malls. Its history dates back to the ancient Greek in 7th century BC, along with that of the Romans in 8th century BC. Here, you can explore a range of activities from boating to sightseeing. Its pristine natural environments and medieval buildings and monuments have attracted a number of painters to the region including Roger Broders, Paul Cezanne, Marc Chagall, and Georges Braque among others. Other attractions that you can add to your list of places to visit in Monaco include Jardin Exotique de Monaco, Larvotto Beach, and Rock of Monaco.